Both the terms are closely related terms in business but there is a considerable difference between both Entrepreneurship vs Management processes. An entrepreneur becomes a businessman in the long run. Management surrounds the large spectrum of organization studies. In simple management explain each aspect of the organization and it discusses organization and activity within an organization in order to achieve the desired set of objectives. An entrepreneur is nothing but the person who starts or develops new enterprises by taking all other necessary resources together for the production to get started. In the long run, they also called as a businessman. An entrepreneur is a person who tries to transform an idea into reality by using available resources. The role of the entrepreneur is very vital, and they have full power and authority of the business. In short, entrepreneurship is the activity of setting up business or businesses, taking up financial risk in hope of profit. Entrepreneur is a person who takes risk and uncertainty of business. Entrepreneur is the person who leads the organization in the market no matter how many competitors will come later but their position will remain untouched. Starting a business generally requires business concept, idea, service new technology, People for support, a process by which service or product will be delivered, money to run all activities. Creating or planning the new product. Entering into new markets and strategizing the next marketing move. Finding a new business venture. Taking an idea and executing them. Entrepreneurship is the control and deployment of resources to create and innovative economic organization for the purpose of profit and growth under the condition of risk and uncertainty. The successful and sustainable business requires entrepreneurship and innovation. Entrepreneurship is a mindset an attitude and taking a particular approach to doing things. 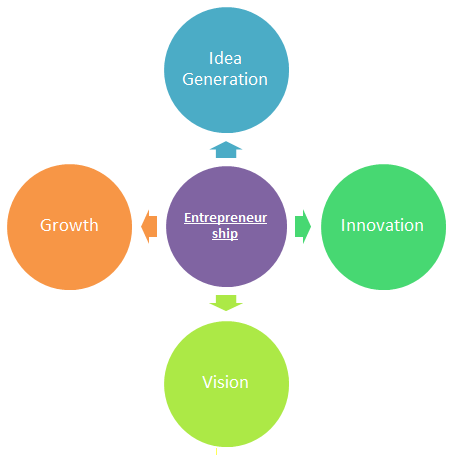 Entrepreneurship often requires creativity and innovation while addressing a new opportunity or concern in a new way. Ritesh Agarwal – Oravel Stays Pvt. Ltd.
Management is one of the arts of getting things done through and with people in the formally organized group. So management is an individual person or group of people that accept responsibilities to run the organization. Management generally brings all the’ (Men and Women, Money, Machines, Materials, Methods, and Markets) together to run the business and to achieve the objective organization. Management is responsible to focus on business objectives and see that the work has been done as per planned. Getting work done through people. Its group activity and not an individual activity. Use a professional approach at work. So management is nothing but the process of running an organization with help of available resources and achieve goal or objectives which are set by an entrepreneur. So management is the employee of a company. Some of the primary functions of management are. 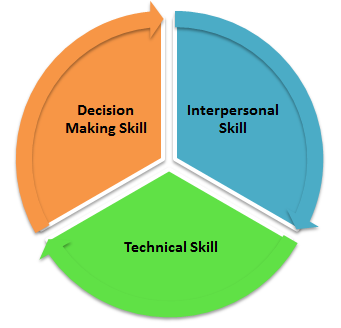 The above-listed functions links directly to below mention skills in graphics. So management is simply directing employees what to do. Management overall is about an organization and its role is to ensure that a company’s all moving parts working properly together and to guide the organization towards goal and achievement. So management is a critical element in the growth of an organization. Let us discuss some of the major differences between Entrepreneurship vs Management. Entrepreneurship is a process of creating enterprise by taking a financial risk in order to get the profit whereas management is an art of getting things done through proper planning, organizing, directing and controlling. An entrepreneur is focused on new business venture whereas the main focus of management is to manage the ongoing operation. Ownership of an organization stays with entrepreneur whereas management is an employee of the organization. The entrepreneur will get profit as rewards whereas management will be getting paid for their work. An entrepreneur is risk taker where management doesn’t take any risk. Entrepreneurs hold all the right to enjoy complete financial freedom of the business whereas Management doesn’t enjoy complete financial freedom of the business. An entrepreneur is an innovator whereas management executes the innovative idea. Management is a Wide range of organization studies it includes all whereas Entrepreneurship is One of the parts of management. Meaning It is a process of creating enterprise by taking a financial risk in order to get the profit. It is an overall business activity which is getting done through and with people in a formally organized group. Decision Making Make a decision on personal perception and gut feelings Make a decision after collecting detailed information and reaching an operative conclusion. Fraud An entrepreneur is not getting involved in fraudulent behavior A manager may involve or cheat by not working hard. This has been a guide to the top difference between Entrepreneurship vs Management. Here we also discuss the Entrepreneurship vs Management key differences with infographics and comparison table. You may also have a look at the following articles to learn more.